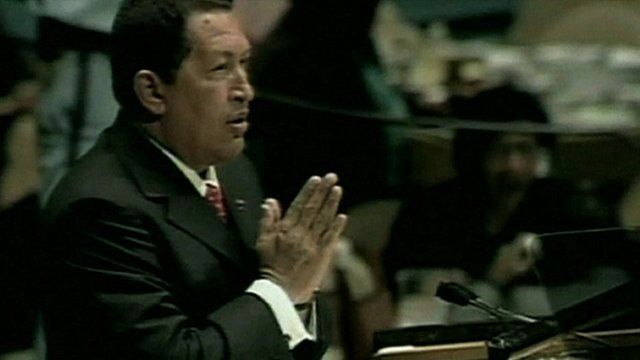 Will Hugo Chavez get a fourth term? Jump to media player BBC Mundo's Margarita Rodriguez explains how the upcoming elections could affect the balance of power in Latin America as well as the world. Venezuela rallies for opposition Jump to media player Thousands of people have attended a rally in the Venezuelan capital Caracas in support of the opposition candidate, Henrique Capriles. Chavez registers for president poll Jump to media player Venezuelan president Hugo Chavez registers to run for a third term in October's elections. Venezuelans will go to the polls on 7th October to choose the country's next president. Hugo Chavez seeks to extend his 14 year rule for another six-year term - officially his third under the current constitution. He served another term before the law was changed. He has been the leader of what he has called a "revolution of 21st Century socialism" but argues that he needs more time for it to succeed. BBC Mundo's Margarita Rodriguez explains the background to the election, and the global impact the result will have.